Today I just wanted to have some fun. I’ve allowed the pressures of construction, work and self-imposed demands to weigh me down, so I’m looking for a little friviality. But I’m not one for online games since I do too much screen time for work. I prefer board games. 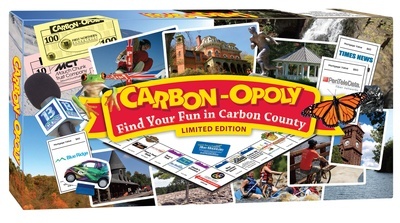 So I bought a new game the Carbon Chamber put out, “Carbon-opoly”. It’s Monopoly with a Carbon County, PA spin. I haven’t opened the box yet but hope to do that sometime soon. The Carbon Chamber & Economic Development is selling them as a fundraiser. What can you do on a rainy day when you can’t focus any more after working for 10 hours and don’t want to tax your brain? TV will just veg me out, so I’ll wait until before bed for that. Believe it or not, I have a pack of jax and a ball, too. Maybe I’ll just play a couple games of that while I’m starting supper. Or maybe I’ll just play some solitaire with real cards. What do you do for pure fun? 1 Response to Want some fun? I love spending all the time I can with my 2 dogs! Love them so much.